Rovers defeated in the opening fixture of the 2018/19 campaign at the ABAX Stadium. First-half goals from Matt Godeen and Mark O’Hara proved to enough for the hosts, as a resurgent second half display from Rovers saw Tom Lockyer score late on, but it was little too late to force a late equaliser. In the build-up to the season opener, Manager Darrell Clarke handed debuts to two summer arrivals, with Alex Rodman and Ed Upson making their first appearances for the Club. Tom Nichols was named in the starting XI, facing his former club, while Tom Lockyer and Tony Craig resumed the defensive pairing at the heart of the Rovers back-four. On the bench, Rovers had attacking options in the shape of Gavin Reilly and Sam Matthews. As the opening period of the game played out, the hosts took an early lead inside the opening two minutes. A cross from the Jason Naismith soared into the Rovers area and was headed back across goal by Matt Godden, with his glancing header deflecting off the post on its way past the diving Sam Slocombe, as the hosts took an early advantage in the contest. Rovers looked to settle from the setback of conceding and responded with two chances on goal. A searching ball forward Chris Lines was perfectly weighted to run into the path of Tom Nichols, as the striker took a touch to break into the Posh penalty area before his left-footed attempt was held on the ground by ‘keeper Aaron Chapman. Nichols’ effort was quickly proceeded by a forcefully struck set-piece from Chris Lines from twenty-yards out that was deflected away by the defensive wall, with the ballooning rebound narrowly avoiding Tom Nichols inside the six-yard area, as Chapman grasped the ball gratefully in his clutches. As the opening forty-five minutes progressed, Peterborough doubled their lead in the 26th minute, with Mark O’Hara getting his name on the scoresheet. It was a header again that provided the goal, as O’Hara peeled free inside the Rovers area and guided a pacy header that nestled into the top corner. 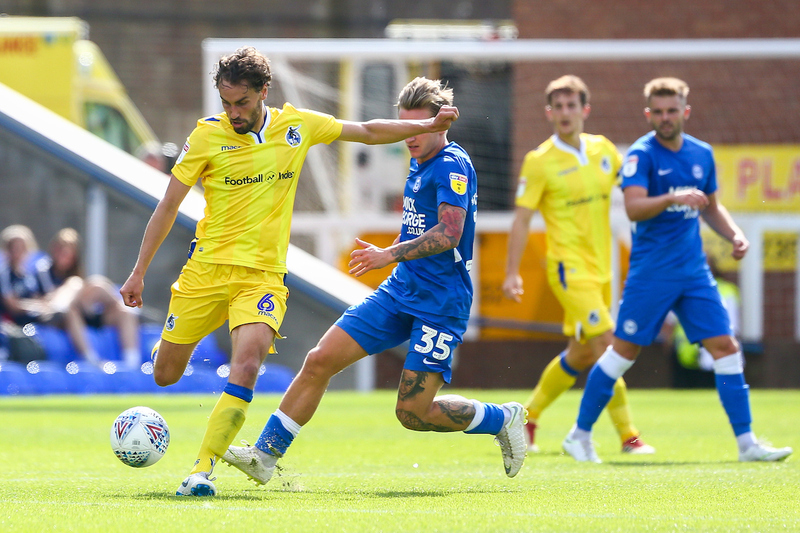 The deficit was almost reduced on the half-hour mark, as Ed Upson controlled an awkward pass on the edge of the Posh area and took advantage of the bouncing ball to unleash a volley towards goal that flashed past the post. With half-time on the horizon, Rovers looked to force an attempt on goal as Kyle Bennett snatched possession from Ryan Tafazolli inside the Peterborough area. The winger looked set to win his dual with the defender and was about to launch a shot towards goal before the move was halted by the referee’s whistle. In the closing moment of the first half, Alex Rodman struck a right-footed shot towards goal that climbed steeply over the crossbar, as Rovers headed into the break behind. As play resumed after the interval, Rovers began the second period in a lively fashion. From the right, Daniel Leadbitter carved out a cross that puzzled the Posh defence, with the ball falling into the path of Liam Sercombe. Stretching off-balance the midfielder couldn’t fashion an attempt on target, as the ball was hurried away from danger. The opportunity was quick followed by a swerving attempt from range provided by Kyle Bennett that just veered off target from twenty-five yards out, with the winger encouraged to test Chapman by the vocal travelling support. Darrell Clarke’s side kept asking questions of the host’s backline, as a prolonged period of build-up play inside the Peterborough half resulted with a measured ball being played into the box by the experienced left-foot of Tony Craig. The direction of the delivery from the defender stretched Peterborough’s defensive line, as Alex Rodman emerged to head the ball towards the target and tasked Chapman to make a reaction save before the flag was raised for offside. As the hour passed, Gavin Reilly was brought on, replacing Daniel Leadbitter in an attack-minded substitution, with Sam Matthews introduced moments after at the expense of Bennett. Matthews had a strong appeal for a penalty denied, as the winger collided with Tafazolli inside the area, but the referee was quick to dismiss the appeals for a spot-kick from the surrounding Rovers players. In the closing minutes, Rovers enjoyed the majority of possession, but the resilient Peterborough defence limited clear-cut chances on goal. A late corner from Chris Lines did meander its way through the busy penalty area to find Tom Lockyer, but the defender wasn’t expecting the delivery to reach him and couldn’t muster an effort towards goal. It was again a corner from Lines that provided an opportunity for Rovers to reduce Peterborough’s lead. This time it was Bernard Mensah who attacked the well-worked set-piece from Lines, but meeting the ball at pace, the winger’s forceful header bounced away from goal. Two minutes after the fourth official indicated an additional four minutes of play, Rovers clawed a scrap of hope back through skipper Lockyer, who was alert at the back post to nod home James Clarke’s looping cross amidst a spell of sustained pressure from the visitors. However it proved too little too late, as the Posh resisted what would’ve been an extremely dramatic comeback to claim all three points. Rovers XI: Sam Slocombe (GK), Daniel Leadbitter (62′ Gavin Reilly), Tom Lockyer (c), Tony Craig, James Clarke, Liam Sercombe, Ed Upson, Chris Lines, Alex Rodman, Kyle Bennett (64′ Sam Matthews), Tom Nichols (70′ Bernard Mensah). Subs: Adam Smith (GK), Tom Broadbent, Michael Kelly, Luke Russe, Sam Matthews. 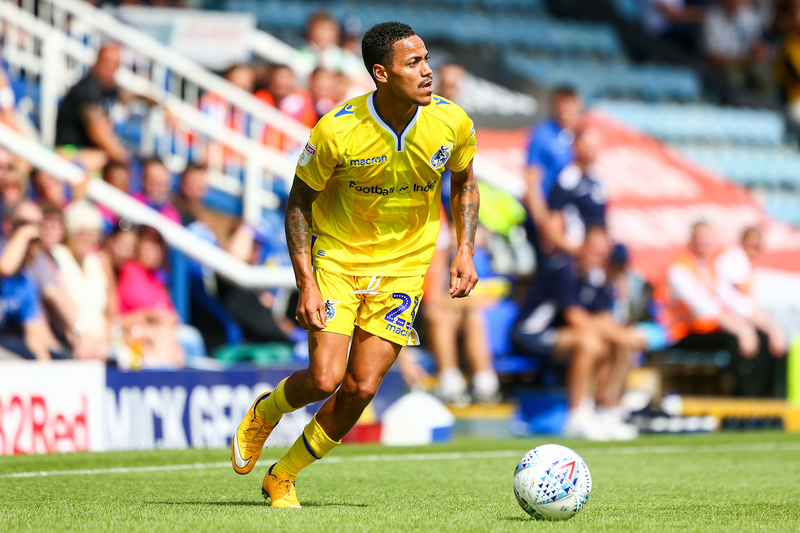 Peterborough XI: Aaron Chapman (GK), Jason Naismith, Colin Daniel, Alex Woodyard, Ryan Tafazolli, Mark O’Hara, Matt Godden (85′ Matthew Stevens), Siriki Dembele (80′ Louis Reed), Joe Ward, Rhys Bennett, Jason Cummings (60′ Callum Cooke). Subs: Conor O’Malley (GK), George Cooper, Josh Yorwerth, Tyler Denton.